The Whitney did close for May Day, but only because it fell on a Tuesday, and the museum is always closed on that weekday. The occupation of a near facsimile of the museum’s official site, and the requests that it launched (to break with corporate sponsors, lower admission prices and allow free entry to one of the building’s floors),3 reflect the salient issues of the recently closed biennial: how inside and outside are constructed, and access and membership negotiated in the museum. This biennial concerned itself with physical presence in social space. While the majority of the 57 selected artists were represented by works on constant view, many also contributed to an intense performance and moving-image schedule, making for an ever-transforming exhibition. The fourth floor was largely emptied out for the use of five rotating artists-in-residence and the first-floor theatre screened week-long reviews of single artist’s film or video work.4 Frequent pilgrimage to the museum was necessary to keep abreast of the daily-changing programme of time-based work, the most extensive to date of any Whitney Biennial. Though there was no pretence that one might see it all, with the Whitney’s day-long entrance fee at $18, to really experience this biennial it made sense to purchase an individual museum membership, covering year-long admission for $85. In contrast with the desire to ‘take art into the streets’, Breuer intended that his Whitney Museum ‘should be an independent and self-relying unit ... It should transform the vitality of the street into the sincerity and profundity of art.’6 Indeed, the Breuer building as skin became a focal point in this biennial: all the artworks were contained within the museum’s site, making a break with the inclusion of off-site works in the past several biennials.7 The curators for 2012, Jay Sanders and Elisabeth Sussman, prioritised change for museum devotees, through exposure to all kinds of art not readily associated with Breuer’s elegant galleries. Crossing the short concrete bridge over Breuer’s moat to enter the Whitney Biennial 2012, the construct of inside-outside was manifest just beyond the ticket-taking guards in Oscar Tuazon’s For Hire (2010), which filled the ground-floor’s small gallery. Tuazon’s odd, stuck-together building parts referenced the utility of Modernism’s materials, without the functional follow-through: wooden or metal beams supported a modular sculpture of mismatched linoleum, fibreglass and cheap industrial surfaces, with doors that served not to demarcate interiors but to temporarily block passage through open space. Late in the biennial’s run, For Hire was disassembled and reconfigured on the fourth floor, as the support for a fashion show by K8 Hardy. Hardy’s clothes, photographs and sculptures play exquisite corpse with street fashion. The pair’s collaboration breached the high-art mandate of Breuer’s vision for his building with shrill aggression. The disruption of their commercial materials so contrasted Breuer’s refined, grey structure as to appear alien, drawing attention to what the museum can contain despite itself. 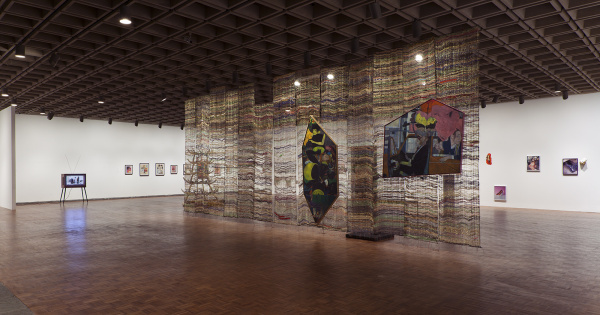 Mauss offered a late overture to an exhibition mostly populated by artists who contributed to the Breuer galleries as museum-goers, participating in history as made within the museum. For instance, Jutta Koether’s paintings updated Nicolas Poussin’s The Four Seasons (1860–64) with depictions of designer trends and finance charts in fast brushstrokes; these dangled from the ceiling rather than on the wall. Elaine Reichek sampled centuries of historical paintings and texts, adopting the notion of narrative thread from the ancient myth of Ariadne in embroidered works and a tapestry. Moyra Davey displayed her photographs of Mary Wollstonecraft’s letters as preserved documents: gathered for display after having been mailed to women in her family, they evidenced their physical effacement from circulation. Richard Hawkins’s paintings, contemporary re-stagings of Gustave Moreau’s Salomé Dancing Before Herod (1876), were interspersed along a lengthy frieze-arrangement with his paper collages of Western images, in turn based on the butoh-fu notebooks of choreographer Tatsumi Hijikata. A placard offered Werner Herzog’s thoughts on his choice of the etchings of the Dutch artist Hercules Segers (c.1589/90–c.1633–38) as the subject of his video installation Hearsay of the Soul (2012): ‘the father of modernity in art … his work creates an illumination inside of us, and we instantly know that this is not a factual truth but an ecstatic one’. The artist Wu Tsang similarly appropriated a building, but of far different trappings, to consider access and belonging in relation to art’s purview, as complicated by the politics of gender, race and economics. The creative and social history vessel in which this transgender Asian-American artist takes refuge is an LGBT, immigrant-safe club in Los Angeles, the Silver Platter. In his documentary video Wildness (2012), screened as part of the film and video programme, Tsang recounts how he found a spiritual home in the Silver Platter and began to organise a ‘performance party’ there, ‘Wildness’, with a group of artist-deejay friends. As the event’s notoriety spread – Tsang’s camera courses over average white guys and other new onlookers – the club’s existence as a ‘safe space’ becomes questionable. The building as other, as a space for projection and imagined dialogue, is the material through which Wildness documents Tsang’s changing performative persona, as club promoter, legal aid activist and artist, amidst a creative community physically vulnerable to both violence and deportation outside the Silver Platter. Tsang’s work speaks for the unpredictable forms that art can take in a space, and wreak on it, and it insists on the right to privacy and limited access. On the fourth floor of the Whitney building, Tsang furnished two rooms like a nightclub’s dressing rooms, with leather couches, mirrors and footage of the Silver Platter on monitors, for the installation Green Room (2012). These were utilised as private spaces for the performers in the adjacent gallery to escape to; only when they didn’t need them were museum-goers allowed entry. …invitation to an individual artist to live in the Museum for the duration of the Biennial … is a far too limited, perfunctory attempt at merging art and life. Rather than provide special accommodations to just a single individual, the Museum will now also offer up the fourth-floor performance space as a cultural commons available to all, creating a space for collaboration, performance, organising and creative reuse where public, nonhierarchical, radically democratic groups can freely gather. Should achieving total access be the desired endpoint, perhaps there can be no more Whitney Biennials, an event that selects insiders. With two years still to go, the Arts & Labor group of Occupy in New York have already proposed an extreme intervention for the next biennial, in their recent statement ‘End the Whitney Biennial 2014’: ‘We therefore call upon the Whitney to terminate its collusion with this system of injustice and use its resources to imagine sustainable models of creativity and culture that are accessible not just to Americans but to people around the globe.’12 Yet the unexpected presence of Occupy was an aberrance that accidentally fulfilled the 2012 biennial curators’ effort, as discussed in their conversation in the catalogue, to call in artists who would ‘show up and create a live, unpredictable scenario. Which, in a way, is the whole Biennial.’13 Sanders and Sussman risked seeming old-fashioned in their total commitment to the Breuer building as the 2012 biennial’s site, and in their selection of so many inward-looking artists, but the exhibition became timely through its openness to immediate events. The participation of Occupy added forward-momentum. Chances are the next Biennial will happen, founded in desire for another intervention in getting in. Monika Szewczyk defends the Berlin Biennial against its detractors, seeing it as a reorganisation of labour among peers. Tom Snow reflects on the aesthetics of protest that have emerged in Istanbul since May, and questions why the stakes in the formation of a ‘public domain’ were not made more explicit in the 2013 Istanbul Biennial. Saul Anton visits the Whitney Biennial and asks how a museum can productively survey today’s different modes of art making.